On May 31, 1850, Pope Pius IX established the Diocese of Nesqually and named Augustin Magloire Alexandre Blanchet its first bishop. A. M. A. Blanchet’s brother, F. N. Blanchet, became the first Archbishop of Portland (Portland thus became, by a curious turn of events, the second archdiocese in the United States!). A. M. A. Blanchet took up residence in Vancouver, Washington. January 23: Bishop Blanchet dedicates first Cathedral of St. James in Vancouver, Washington: “The Blessed Sacrament is placed in the tabernacle… The church, dedicated to St. James is then, at this moment truly, the House of God, and the Gate of Heaven. We can say now, The Lord has sanctified this house which was built to establish His name here, and His eyes and His heart will always be here.” Read more in the Centennial Gazette. Mother Joseph and the Sisters of Providence arrive to assist Bishop Blanchet with his fledgling diocese. Read more in the Centennial Gazette. The legendary Seattle pioneer Francis Xavier Prefontaine made his first visit to the settlement in December, 1867. He canvassed the entire population for Catholics, found 10, of whom 3 attended the Mass he offered on Sunday in a rented room! And yet, for some reason, Father Prefontaine did not give up on the settlement. 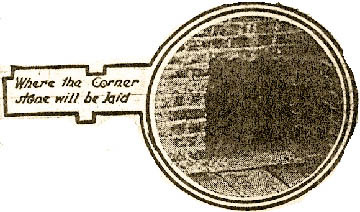 He rented a shanty at 3rd and Jefferson, and began to offer Mass there. Though Bishop Blanchet told him that Seattle was “a lost cause,” Father Prefontaine was convinced of its potential for growth. He bought a plot of land which he cleared with his own hands. Our Lady of Good Help, the first Catholic Church in Seattle, is dedicated at 3rd and Washington. Father F. X. Prefontaine is its architect and pastor! Read more about Father Prefontaine in the Centennial Gazette. Father Prefontaine had come to admire the work of the Sisters of the Holy Names at home in Canada. Founded by Blessed Marie-Rose Durocher with a mission to educate the young, the congregation was named in honor of the Holy Names of Jesus and Mary. Their motto: “Jésus et Marie, ma force et ma gloire”—“Jesus and Mary, my strength and my glory.” In 1880, Father Prefontaine purchased a lot for a new school at 2nd and Seneca, and invited the Sisters of the Holy Names to come from Portland and open a school. Their success was such that three years later they built a new, much larger school at 7th and Jackson. Bishop Aegidius Junger (consecrated Bishop of Nesqually in 1879) begins construction on a new St. James Cathedral in Vancouver. Read more in the Centennial Gazette. 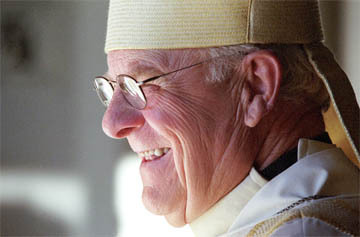 Bishop Junger dies on December 27. The Sisters of the Holy Names record the event in their chronicle: "Truly can it be said, 'In the midst of life we walk in the shadow of death.' Hardly two weeks have passed since his Lordship visited…, gave Benediction…, and spent some time in the community entertaining us in a fatherly manner, little dreaming that the destroyer Death was so near at hand. Ever since our sisters came to Bishop Junger’s diocese they have received nothing but kindness at his hands; we realize that in his death we lose a true father and sincere friend." On September 8, Edward J. O’Dea of Portland is consecrated Bishop of Nesqually, in Vancouver, Washington, site of the first St. James Cathedral. Read more at the Centennial Gazette. Even before O’Dea arrives in Vancouver, Father Prefontaine writes to him to encourage him to move to Seattle. "Seattle has become and will remain the headquarters and chief battleground of all the elements hostile to the church. The morale of the church militant requires the inspiring presence of her leader where the battle wages fiercest," Father Prefontaine writes. Bishop O’Dea applies to Rome for formal permission to move his seat to Seattle, and secures a plot of land at 9th and Marion on First Hill, overlooking Seattle. In the meantime, on February 15, he establishes Our Lady of Good Help Church as his pro-Cathedral. Preaching from the pulpit of the historic church, Bishop O’Dea announces the move, and simultaneously announces the building of a new Cathedral Church. "'Father Prefontaine’s Church,’ as it has been called for so long, will now be the Bishop’s church,” reported The Progress. October 19-28, a week-long Cathedral Fair in the old Armory raises nearly $20,000 for the cathedral building fund. "Patronize the Fair in every way you can," the Fair Bulletin reads. "If it is impossible for you to attend it yourself, then talk your less enthusiastic neighbor into going. Tell him how sorry you are you can't be present to take part; and, as a proof of your sincerity, give him a couple of dollars to bring nick-nacks home for your children." Meanwhile, Bishop O'Dea seeks out designs for the new Cathedral. On November 13, at 10:30am, Bishop O’Dea founds the Cathedral parish and blesses St. Edward's chapel on the corner of Terry and Columbia. "No matter how many grand churches we may build, if we are not consistent and spiritual-minded we shall not profit thereby," said Bishop O'Dea. "One should join in the building of temples to God through fervor, through a desire to see more charity, more and higher degree of morality, love, and harmony among Christians. The glory of God is the ultimate end sought in spreading religion. Our whole business here is to know and serve God." The architect of St. Edward’s Chapel, James Stephen, had a significant role to play in Seattle history. He was the official architect for the Seattle School District, and some of the buildings he designed (the Northwest School on Capitol Hill, John Hay School, Lincoln High, Everett High, and Thompson Hall at Washington State University) have become area landmarks. Originally a cabinet-maker and organbuilder, Stephen learned architecture through a correspondence course (not unusual at time time!). Bishop O’Dea invited him to submit a design for the Cathedral, and though Stephen didn’t win that contract, he did build St. Edward’s Chapel. He was also responsible for the rebuilding of Our Lady of Good Help when the historic church was “moved” to make way for the railroad. On November 12, 1905, almost exactly one year after the parish was founded, Bishop O’Dea lays the cornerstone of the Cathedral. "New Catholic Cathedral at Corner of Ninth Avenue and Marion to Be Given to World This Afternoon," the local paper reported. A significant amount of work has already been done, and the towers have begun to rise on the west end of the building. Gathered with priests and visiting prelates and an assembly of thousands, Bishop O’Dea seals the stone with a silver trowel. In it, he places a lead container with photos of the earlier cathedrals (there were two of them! ), names of the priests of the diocese, copies of the newspapers of the day, coins, medals, and other souvenirs. Longtime parishioner Frances Kelly writes: “My aunt, Alice Fairbairn, was a student at St. Rose's Academy in 1905. The Academy was located on Broadway near E. Madison St. and staffed by the Holy Names Sisters. A group of the students, including my Aunt Alice, played the violin at the groundbreaking ceremony for St. James Cathedral in 1905. The historic significance of this occasion was important to my aunt, as we heard her mention it many times in her later years. She was about age 14 at the time of the ceremony, and lived to be 100." Grand Cathedral crowning our hill! 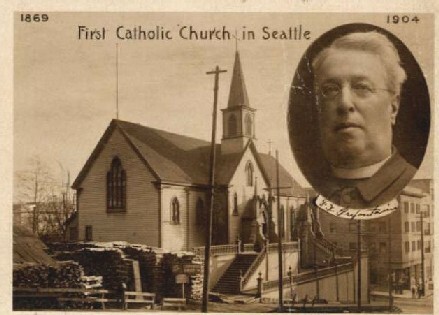 On September 11, 1907, the Holy See grants permission to move Cathedral to Seattle. "Seattle will be Catholic Center," the P-I reported. "Rome Yields to Facts." On December 15, the doors of the new Cathedral are opened for the first time. The occasion is an organ recital given by Dr. Franklin Sawyer Palmer, on the brand-new west gallery organ. The first piece played on the new instrument, built by the noted Boston firm of Hutchings-Votey: Bach’s Grand Fantasia and Fugue in G minor. As 1907 draws to a close, Bishop O’Dea gets impatient to move in to his new Cathedral. He had hoped to dedicate on Thanksgiving Day, November 29. But there are various delays. The organ isn’t finished; the tabernacle key goes missing; part of the altar rail disappears. O’Dea keeps up a steady flow of correspondence with Benziger Brothers in Chicago, who supply most of the furnishings for the Cathedral; and some of this correspondence gets quite technical (instructions for how to install the altar rail and the sanctuary lamp, for example!). At the same time, Bishop O’Dea is still waiting for official word from Rome. In a letter dated October 7, 1907, with his Cathedral almost ready for dedication, Bishop O’Dea asks yet again for permission to remove his See to Seattle and to change the name of the Cathedral from “SS. James and Augustine” to “St. James.” Permission is granted on September 11, 1907, but nail-biting delays prevent it from reaching Bishop O’Dea until the end of October. On December 22, at 3:00pm, the Cathedral is dedicated; more than ten years have gone by since Father Prefontaine first suggested to Bishop O’Dea that he consider moving his seat to Seattle. "As I look out over this immense congregation today," Bishop Carroll states in his homily on that occasion, "my thoughts go back to the year 1850, in the history of Washington, when Bishop Blanchet had as his episcopal territory the newly created territory of Washington. He had very few souls to which to administer the comforts of religion... What a vast change has come over this country since then. A few years ago Seattle was unknown. Today a city has been built up that bids fair to outstrip every other city on the Pacific Coast." Acoustical Difficulties. 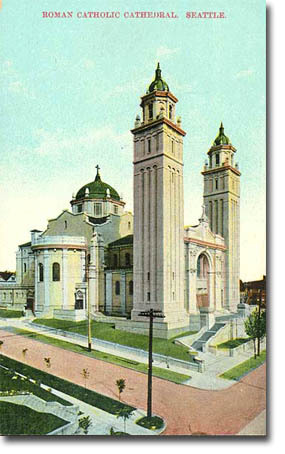 In February, 1908, the Catholic Northwest Progress notes: "Work is being pushed to correct the unfavorable acoustics of the Cathedral, and it is expected that in a short time the evil will be altogether eradicated, and although the acoustic properties of the Cathedral are not all that could be desired, still they are not as bad as one would be led to believe by the article which appeared in last Sunday’s issue of the Times. The article referred to was published without any interview having been held with those in charge of the Cathedral." On April 29, 1908, Bishop O'Dea celebrates the Silver Jubilee of his ordination to the priesthood. In June of the same year, the first priest is ordained in St. James Cathedral: "Rev. Mr. Lighthouse of the Benedictine Order," according to Robert Snodgrass's 1929 history. In October, the newly-arrived Carmelite Nuns visit St. James Cathedral. Read their first-hand account of their visit here. March 4. Monsignor F. X. Prefontaine dies at age 71. In his 40 years of ministry, he has changed Seattle history. 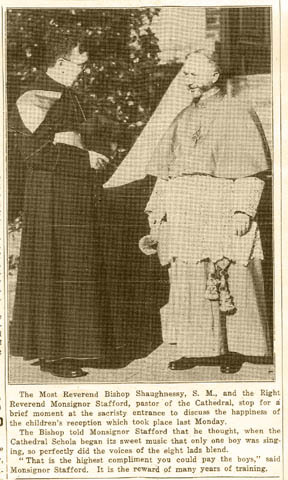 The Sisters of the Holy Names record the event: "News came at eleven o’clock this morning that our venerable chaplain was failing rapidly and at once Sister Superior and Sister Mary Eleazar hastened to his home where they met Sister Vincent of Providence Hospital and Sister M. Hillary. Together they prayed at his bedside and assisted at the administration of the last rites of Holy Church. At 3:30 death came peacefully, our aged chaplain having been solaced in his last hours by the presence at his bedside of Right Reverend E. J. O’Dea, D.D., Bishop of Seattle, who administered Holy Viaticum to the dying priest and gave him all the last indulgences. May he rest in peace." Meanwhile, George Mahoney refuses to set foot in St. James Cathedral. Read the story here. Msgr. William Noonan succeeds Msgr. Daniel A. Hanly as pastor of St. James Cathedral, April 17, 1910. In August, Monsignor Noonan announces that ground is being cleared for the construction of a Cathedral School. In fall of this year, the Sisters of the Holy Names of Jesus and Mary begin the Cathedral School, working out of a few spare classrooms at St. Rose’s Academy. 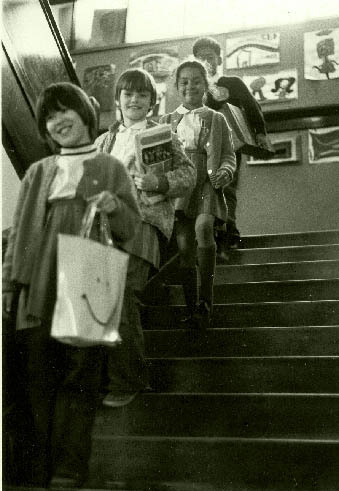 Immediately after their Easter vacation, the Sisters of the Holy Names move into their new school building on the corner of Terry and Columbia, the site of the old pro-Cathedral Chapel. Bishop O'Dea blesses the new Cathedral School on April 21, 1912. The school is very modern for its time, with a rainy day play area and gymnasium in the attic. Within three years, the enrollment has grown from 96 to over 300. Father Theodore M. Ryan, ordained at the Grand Seminary at Montreal (the first native-born Seattleite to be ordained a priest), says solemn Mass in St. James on December 27. In January, Rev. W. J. Noonan, Pastor, notes: "Obstacles to our progress which have loomed large and threatening have been overcome and difficulties have been smoothed from our pathway by His merciful interposition." On February 2, the feast of the Presentation of the Lord, after an unusually heavy snowfall, the Cathedral’s great dome collapses. The Cathedral, dedicated just nine years before, is closed for more than a year for repairs. (Read the sisters' first hand account.) 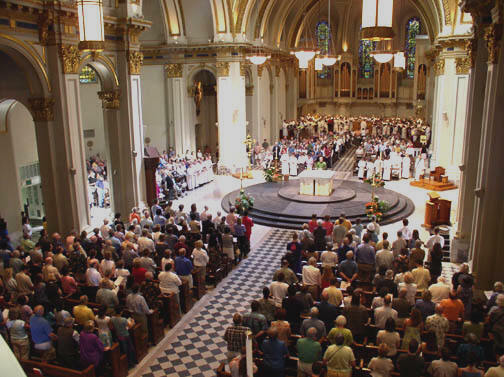 The Catholics of the northwest contribute generously to the rebuilding of the Cathedral, and many renew the gifts they made nine years before. Read more about the Dome collapse here. In the same year, Mother Cabrini opens "Columbus Sanitarium"--later Cabrini Hospital--on the corner of Madison Street and Terry Avenue. An advertisement for the Hospital states: "On the roof garden of the Columbus Sanitarium those who are weary from strenuous mental work or the cares of a busy life, may breathe the pure invigorating air that sweeps down from the lofty snow-capped peaks of the Cascades and rugged Olympics, wholesome air that is tempered and spiced by the salt winds from the ocean. One may enjoy from the roof garden unsurpassed vistas of Puget sound, Lake Washington and the surrounding ranges of mountains." On March 18, the Cathedral reopens, with a strikingly different interior, the work of local architect John Graham. Where the dome had been is a flat ceiling with a fresco copy of Raphael’s Ascension. There is one improvement: the acoustics are significantly better without the dome! The Progress notes: "The whole occasion was marked by a feeling of satisfaction much similar to that experienced when the building was first completed 11 years before. It is to be hoped that someday circumstances will permit the replacement of the great dome.” Read more about the restored Cathedral here. On July 25, a bishop is consecrated at St. James Cathedral for the first time: The Very Rev. J. R. Crimont, SJ, is made Bishop of Alaska. Seattle is struck by the great flu epidemic. Read more here. 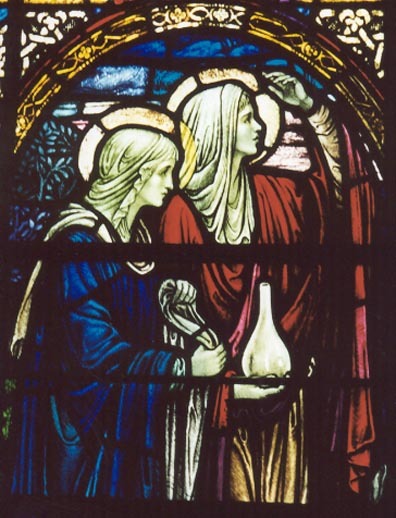 The Cathedral’s stained-glass windows, the work of Charles Connick, are blessed by Bishop O’Dea on Sunday, March 23. On March 25, Rt. Rev. Joseph McGrath is consecrated bishop of Baker City, Oregon. On April 10, Cathedral pastor Father William Noonan departs for his new parish of St. Patrick's, Tacoma, and Msgr. James Stafford becomes the third pastor of St. James Cathedral. Msgr. Stafford is a brilliant fund-raiser. Thanks to him, St. James Cathedral becomes one of the first parishes on the west coast to use the “envelope system” for weekly offerings, something we now take for granted. Read more about Monsignor Stafford. Beware of traffic at stairs; wait for signals before crossing stairs. If you lose your way follow the crowd. Don't fear seniors; they never notice freshmen. Don't play tag in the halls, it bothers juniors. Don't listen to sophomores as they like to show their authority, but they are only freshmen once removed. Dark Night, Fat Man, Banana Peel, Virginia Reel. Most of us think that the school rules were made for someone else. On February 5, the first ever radio broadcast of a Catholic sermon is broadcast from St. James Cathedral, where Paulist fathers Quinnan and Donegan are giving a series of mission sermons. On March 17, ground is broken for O'Dea High School. On March 16, O’Dea High School is dedicated, staffed by the Christian Brothers of Ireland. "As a token of grateful respect from the parish, our bishop's name was given to the new institution." Between the boys of O’Dea and the children of the Cathedral School, there are hundreds of young people around the Cathedral every day! Each day, Terry Avenue is closed off to become a playground for the children. Six Seattle priests are made monsignori by Bishop O'Dea and Pope Pius XI, including Father Hanly, the Cathedral's first pastor; W. J. Noonan, the Cathedral's second pastor; J. G. Stafford, the current pastor; and Theodore M. Ryan, first Seattleite to be ordained a priest. Monsignor Stafford broadcasts the Good Friday and Easter services over the radio. A sanctuary organ is dedicated on February 6 in a concert featuring "noted New York organist, Pietro Yon." The work of Casavant Frères, this new organ is designed to complement the Hutchings-Votey organ in the west gallery, and is equipped with state-of-the-art electrical wiring that allows both organs to be played from a single console. The Progress notes, "CATHEDRAL ORGAN IS MASTERPIECE OF BUILDERS' ART." And on the concert itself: "The perfection of tone quality drawn from the huge ensemble, the precision of the attacks and the grandeur and volume were absolutely thrilling." On September 6, the Cathedral's pastor addresses the National Conference of Catholic Charities with a discourse on "the Social Value of the Parish." "The parish is the smallest social unit of the Church. It is a complete spiritual and social world in itself, barring of course its dependence on higher authority for its charter of powers. Christ, its King, is enthroned upon its Altar, around which is centered all its life and activity... Here the priest, 'the other Christ,' endowed with all the powers of His priesthood, governs and guides His flock 'as one having authority.' Here the faithful, rich and poor assemble as in a peaceful pasture to be nurtured and guided in the ways of sanctification and truth. In a word, the parish is a complete spiritual kingdom. "We have said that the parish is the small unit in the divine organization of the Church. Now this unit to be effective must be thoroughly organized." On March 15, Bishop Hayasaka, the first native prelate of Japan, visits St. James and says Mass in the Cathedral. On Thursday, November 22, the Silver Anniversary of the Motu Proprio of Piux X on the Reform of Church Music is celebrated with Vespers of the Feast of St. Cecilia. On March 12, Father Robert Armstrong is consecrated Bishop of Sacramento, California. The Silver Jubilee of the Cathedral Parish is celebrated with great fanfare November 24-27. "Twenty-five years labor, sacrifice, and achievement in the service of God and humanity will be commemorated in a three-day jubilee celebration of St. James Cathedral beginning next Sunday," the Progress reported on November 22. "It is twenty-five years since the parish life began with the first Mass offered by the Right Rev. Bishop O'Dea in St. Edward's Chapel... The parishioners of St. James' Cathedral will make Sunday, November 24, a general Communion of thanksgiving for all the blessings Almighty God has showered on the parish during the twenty-five years of its existence. They are especially requested to remember all the benefactors, both living and deceased, who have, in any way, contributed to the building up of the parish." Monsignor Stafford provided some interesting statistics on the spiritual works of the parish in those twenty-five years: "Some twenty of our school boys are now in seminaries preparing for the priesthood... Eleven of our school girls are in various convents. Communions in the Cathedral have totaled 1,500,000 and there have been an equal number of confessions heard. Over 2,700 baptisms have been administered, 2,200 marriages have been performed, 1,100 persons have been confirmed, and there have been more than 1,500 burials from this church." Bishop O'Dea himself is home in bed on doctor's orders, and the solemn Mass is celebrated by Bishop Armstrong of Sacramento. For his theme, he takes the words of the psalm: "I have loved the beauty of Thy house, the place where Thy glory dwelleth... I am minded of the beautiful love which David had of old for the House of God... For twenty-five years, the cross atop the Cathedral has carried a message of faith to the visitor here; for twenty-five years the doors of this parish's church have been open to those who seek grace and heavenly solace. How many have been healed and comforted in this holy temple of God!" The silver Jubilee concludes with a social affair on Tuesday, December 3, at the Olympic Hotel. "Present and former members of the parish renewed acquaintanceship at a great card party and social. Bridge and whist were played in the Spanish Ballroom and a social hour was enjoyed, to the accompaniment of the Olympic orchestra, in the Venetian Room. Many prizes were awarded for the successful players at the card party. 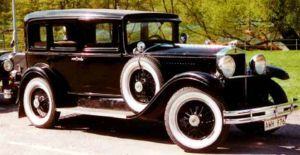 The chief prize awarded, and a rich one, was the Silver Jubilee Hupmobile Sedan." On November 24, Thanksgiving Day, Bishop Edward J. O’Dea celebrates his Golden Jubilee with thousands of the faithful he has served for fifty years of priesthood. Just one month later, on Christmas Day, Bishop O’Dea dies. He has built dozens and dozens of hospitals, orphanages, schools, and churches, and has led the diocese through a time of tremendous growth. Bishop O’Dea died on Christmas Day, 1932, just two days after the 50th anniversary of his ordination to the priesthood. His last words to his family and his brother priests gathered around him were, “God bless you all.” Read more about Bishop O'Dea. 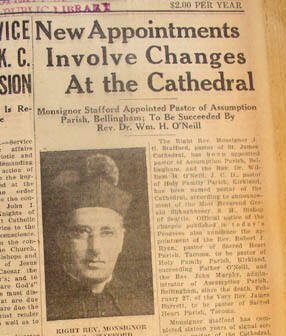 Father Stafford greets the new bishop in this 1933 Progress photo. Progress article announcing that Father William O'Neill will succeed Father James G. Stafford as pastor. On Sunday, June 18--the Feast of Corpus Christi--Father (later Bishop) Gill sings his first Solemn Mass at St. James Cathedral. "After Mass, the solemn procession filed from the sanctuary down the nave of the church amid the resounding strains of the jubilant 'Tollite Hostias' by Saint-Saens, bringing to a close a ceremony of perfect beauty, of joy to the parish and of supreme happiness to the young priest." October 13. Gerald Shaughnessy, S. M. is installed as the second Bishop of Seattle. He came to Seattle from Washington, D.C., where he had gained experience as an administrator, and had published a study of Catholic immigrant populations in the United States entitled, Has the Immigrant Kept the Faith? At his installation, Bishop Shaughnessy pays tribute to Bishop O’Dea, saying, “His crozier is in my hand, his ring is upon my finger, his cross is upon my breast, and the golden chain of his love binds us in sacred unity. We shall strive to continue his work and his policy.” But in the midst of the Great Depression, it proves impossible to continue Bishop O’Dea’s model of building and growth. Bishop Shaughnessy spent most of his time reducing debt throughout the diocese. Never as popular as his predecessor, Bishop Shaughnessy nevertheless led the diocese through some of its most difficult years, financially speaking, and he also spoke out courageously against racism and prejudice after Pearl Harbor. Read more about Bishop Shaughnessy. On Palm Sunday, 1935, Dr. Palmer suffered a massive stroke. Legend has it that the stroke occurred at the console of the organ during high Mass; though the Progress reported more discreetly that Palmer collapsed “after a rehearsal with his singers.” For weeks he lingered at Providence Hospital, surrounded by his family and friends. He died June 5. During his years at St. James Cathedral, Dr. Palmer had converted to the Catholic faith, though his wife and family had not. At his request, the funeral liturgy was read aloud in English at the conclusion of the Mass. Palmer wanted his non-Catholic family and friends to experience the beauty of the liturgy—and to understand it as well. Read more about Dr. Palmer here. Father William O’Neill succeeds Msgr. Stafford as pastor of the Cathedral. Msgr. James Gordon Stafford led the Cathedral Parish with extraordinary energy and vision for sixteen years. Looking back at his career, the Progress said, “Although necessity forced his genius to manifest itself in financial enterprise on behalf of the Church, it is rather in the artistic realm of the Church’s liturgical ceremonies that hit has had its most complete expression. Under his masterful direction the Cathedral boys choir was developed and historic ceremonies were clothed with such perfection of liturgical wealth and beauty that they are known and admired by priests and prelates throughout the country.” Tall, thin, quiet, scholarly, Father O'Neill is quite a contrast to the dynamic Msgr. Stafford, under whom he served as an assistant for many years. Father O’Neill suffers from health problems all his life, and is ill during most of his pastorate. Father O’Neill dies, and is succeeded by Msgr. John Gallagher. The Cathedral celebrates being completely out of debt for the first time since its construction. After Bishop Shaughnessy suffers a severe stroke, Bishop Thomas A. Connolly—Auxiliary Bishop of San Francisco—is appointed coadjutor bishop with right of succession (February 28). He is installed on April 21. Shifting land destroys the foundation of Our Lady of Good Help Church, and it is razed to the ground. The numbers of priests are such that the Rectory is renovated. A third story is added with additional rooms for the numerous priests in residence. In honor of the Centennial of the Diocese of Seattle, the Cathedral undergoes a major renovation, and is redecorated inside and out. Major changes include the addition of statues and a new window on the west façade, and a total transformation of the interior. Read more about the 1950 renovation here. "Cathedral redecorated for Jubilee is Triumph of Breath-Taking Beauty," the Catholic Northwest Progress reports on Friday, September 8. The first Mass in the new Cathedral is celebrated for the children of the Cathedral School on Wednesday, September 13, 1950. Seattle becomes an Archdiocese, and Bishop Connolly becomes Seattle’s first Archbishop. Seattle priest Father Joseph P. Dougherty is consecrated the first bishop of Yakima in St. James Cathedral. Cathedral Pastor Msgr. Gallagher dies on July 8 and is buried from the Cathedral on July 15. Father Thomas E. Gill is appointed pastor of St. James Cathedral in January. Read more about Father (later Bishop) Gill. Father Gill is consecrated a Bishop at St. James Cathedral on May 31. As Auxiliary Bishop of Seattle, he continues to serve as pastor of the Cathedral. The Second Vatican Council opens in Rome. "To think that I should live to see this day!" Archbishop Connolly wrote. Bishop Gill said: "Vatican II is a historical moment, but more--history itself moving." The Sisters move into the new Cathedral Convent on Columbia Street at Ninth Avenue. In August, Archbishop Connolly celebrates his Silver Episcopal Jubilee. He was ordained Auxiliary Bishop of San Francisco in old St. Mary's Cathedral, August 24, 1939. Bishop John Scanlan of Honolulu, says in his homily for the Jubilee: "He has judged correctly the loyalty, the spirit of sacrifice, and the capacity for achievement of priests and people. What you have accomplished under his leadership bears testimony to the accuracy of his judgment and the forcefulness of his initiative." Read more about this "Year of Contradiction" here. After sixty-one years, the Cathedral Grade School closes and consolidates with St. Mary’s School. For the next ten years, Immaculate High School will occupy the school building. 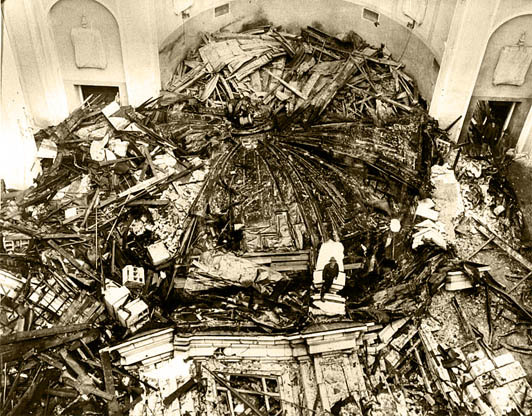 On April 2, 1973, a disturbed man destroys the statue of the Sacred Heart in the north transept, and damages the crucifix and candlesticks on the altar. On November 4, Bishop Gill installs the first lay Eucharistic Ministers. Sister Margaret Jane Downey and Sister Maureen Maloney, both Sisters of the Holy Names, are the first to be commissioned. Read more about the ministry of Extraordinary Ministers of Holy Communion here. One week later, on November 11, 1973, Bishop Gill dies suddenly in Washington, D.C., where he is attending the National Conference of Catholic Bishops. His obituary says, Bishop Gill "was a thinker, a man 'who always had a book in his hand' and he was a man who got things done... Scholar, tireless worker, tolerant man of God: Thomas E. Gill. The city he served so admirably will miss him." Father William E. Gallagher becomes the seventh pastor of St. James Cathedral. In the same year, Archbishop Connolly announces his retirement. During 1974 and 1975, the Cathedral interior is renovated for the third time in its history. New carpeting is installed and a variety of other changes are effected. Archbishop Raymond G. Hunthausen is installed on May 22, at the Seattle Center Arena. He is the second Archbishop, the fifth Bishop of Seattle. Read more about Archbishop Hunthausen's early days in Seattle here. Father Gallagher hires Dr. James Savage as Director of Music. Within a few years, Savage turns the music program around, establishing the men’s chant choir, the Women of St. James Schola, and, later, the Youth Music Program. Get a glimpse of the 80s at St. James through this foray into the Parish Bulletin. In the wake of a Vatican investigation of Archbishop Hunthausen’s bold and controversial ministry, Thomas J. Murphy is appointed coadjutor Archbishop of Seattle. On October 1, Archbishop Hunthausen celebrates his Silver Episcopal Jubilee. Father Gallagher retires. On Sunday, July 24, Father Michael G. Ryan is installed as the eighth Pastor of St. James Cathedral. The Progress reports: "Father Michael G. Ryan remarked during his homily that his is the newest name on a list of 'formidable and intimidating' former pastors. He intoned the names Hanley, Noonan, Stafford, O'Neill, Gill, and two Gallaghers. 'I do qualify in at least one respect,' he added. 'I have an Irish name. Ryan will fit right in.'" Read Father Ryan's homily on the occasion of his installation as pastor here. Read about Father Ryan's appointment and the Cathedral prior to its renovation here. On Thursday, April 18, Archbishop Connolly dies at the age of 91. "A formidable, powerful man who believed wholeheartedly in authority and tradition in the Church, Archbishop Connolly knew what he wanted and made his moves without hesitation. Confounding those who tried to peg him as conservative, however, he was also an outspoken advocate of civil rights, supporting a fair housing ordinance and a boycott of Seattle schools to protest inferior education for minorities," says the Seattle Times. In the same year, Archbishop Hunthausen retires and Archbishop Murphy becomes Archbishop of Seattle. The weekend of August 10-11, 1991, Archbishop Hunthausen preached at all Masses; read his homily here. The next day, Monday, August 12, an interfaith prayer service celebrates Archbishop Hunthausen's ministry. He challenges those present with these words: "We are forever asking ourselves: What is sacred and absolute? What is profane and temporal? What do we keep and what do we discard? What gives us life? What denies us life? What leads us to God? What takes us away? What does the Gospel say about making war? Or making love? These are not easy questions." An arson fire devastates the Cathedral Chapel and sacristy, causing $1,000,000 in damage. The Cathedral is restored and renovated, in keeping with the teachings of the Second Vatican Council. The dust of nearly ninety years is removed, and the glory of the building shines forth as never before. Major changes include the moving of the altar to the center of the building; the installation of an oculus, or skylight; new east apse windows, ambo, altar, and baptismal font; and more. Click here to read about the process of planning the restoration. Click here to read an essay about the work in progress. The Cathedral is rededicated on December 22, 1994. "We celebrate tonight the dedication of our cathedral church, but we need to be reminded that a church building, be it a great cathedral or a humble chapel, fulfills its highest calling not by being the church, but by becoming a house for the church, a house for the people of God. And we are that people," Father Ryan said in his homily for Vespers on December 21, 1994. Click here to read an essay about the Cathedral's rededication. On June 26, Archbishop Murphy dies of leukemia. He is the first to be buried in the Cathedral crypt. On December 17, Alexander J. Brunett is installed as the new Archbishop of Seattle. In April, Messiaen's Trois Petites Liturgies de la presence divine is presented in concert under the direction of Dr. James Savage. On December 24, at the beginning of the Midnight Mass, the opening of the new ceremonial bronze doors by German artist Ulrich Henn marks the beginning of the Great Jubilee Year 2000. 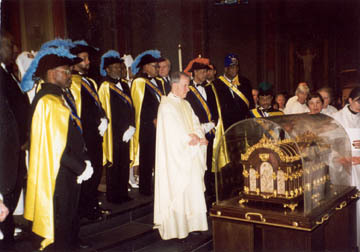 The visit of the relics of St. Therese of Lisieux on January 22, 2000, attracted the largest crowds of any Mass in the Cathedral's history. Estimates ranged from 6,000 to 10,000! During the Great Jubilee Year 2000, thousands of pilgrims find their way to St. James Cathedral for weekly celebrations of Vespers and Benediction of the Blessed Sacrament and for dozens of special Jubilee liturgies for athletes, artists, firefighters, and much more. On January 22, the visit of the relics of St. Thérèse of the Child Jesus bring around 6,000 visitors to the Cathedral. Read more here. George Thomas is ordained Auxiliary Bishop of Seattle on January 28, 2000. During this year, the Cathedral publishes House of God, Gate of Heaven, an extraordinary portrait of the Cathedral’s history and community in words and pictures. Also, the Archbishop Thomas J. Murphy Millennium Organ, a new East Apse organ by the Los Angeles firm of Manuel Rosales, replaces the Casavant. In the wake of the terrorist attacks of September 11, thousands come to the Cathedral to mourn and to pray for peace. The first Schola Cantorum Choir Camp, a summer music camp for young people, is held, August 19-23. September 3-11, the Cathedral hosts Nine Days to 9/11, a novena of prayer in remembrance of the victims of the terrorist attacks of 9/11. Two forums for discussion and special Masses culminate in a solemn requiem. On September 20, six bishops, 160 priests, and 500 faithful gather to honor retired Archbishop Raymond Hunthausen on the 40th anniversary of his episcopal ordination. On January 17, nearly 3,000 people gather at St. James for an interfaith prayer for peace, followed by a procession down Broadway to St. Mark's Cathedral on Capitol Hill. On February 2, a new tabernacle is dedicated. 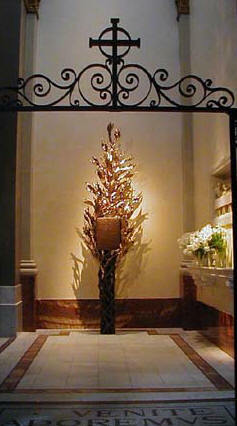 The tabernacle is the work of Ulrich Henn, the same artist who created the Cathedral’s ceremonial bronze doors. March 5-25, the Cathedral hosts a series of Masses and prayers on the outbreak of the war in Iraq. In November, the parish launches a Centennial Campaign, to raise more than $6 million to create a new Pastoral Outreach Center for the parish as well as an outdoor gathering space, and to establish endowments for the preservation of the Cathedral, the Hunthausen Fund, and the Scholarship Fund. On February 2, Anglican and Roman Catholic members of ARCIC gather in the Cathedral for a special celebration of Vespers. On September 27, Cardinal Walter Kasper presides at Mass in St. James. On November 13-14, we celebrate 100 years as a parish with a Cathedral Fair and a whole week of special events. In January, the Solanus Casey Center, a joint project of the Archdiocesan Housing Authority, Detention Ministry, and St. James Cathedral, opens at James and Terry. It is a resource center for people in need. January 23: As part of the parish’s Centennial celebration, a special Mass was held to honor the Sisters of the Holy Names of Jesus and Mary, who have been an integral part of ministry at St. James since 1912. View the album. April 2-20: A series of special prayers and liturgies on the death of Pope John Paul II and the election of Pope Benedict XVI, including a solemn Requiem Mass celebrated by Archbishop Brunett on Friday, April 7. View an album of the events related to the passing of the Holy Father and the election of Pope Benedict XVI on April 19. April 19: The Renaissance altarpiece by Neri di Bicci (1456) returns to the Cathedral Chapel in a festive parade after being restored by the Seattle Art Museum. Album: Neri Di Bicci Procession. November 13: Archbishop Brunett blesses the parish’s new Pastoral Outreach Center on the 100th anniversary of the laying of the cornerstone of St. James Cathedral. View the photo album. November 20: A Year of Prayer and Renewal, a parish program to prepare for the Centennial Year of St. James Cathedral, begins. Read the Vision Statement: Christ our Cornerstone. View the album. December 8: On the Solemnity of the Immaculate Conception, we mark the 40th anniversary of the closing of the Second Vatican Council with solemn Mass, followed by an evening of conversation with retired Archbishop Raymond G. Hunthausen. May Completion of the Archbishop Thomas J. Murphy Courtyard. View the album. June Archbishop Brunett ordains seven men to the priesthood, the largest group of new ordinands in more than 30 years. View the photo album. July 25 Parish celebration of the Feast of St. James--and of the 40th anniversary of ordination of pastor Father Michael G. Ryan. View the photo album. March 24 The first Archdiocesan Day of Reconciliation, in which many priests from across the Archdiocese and about 500 of the faithful take part. May Improvements to the St. Anthony Shrine and the Marion and Terry entrance to the Cathedral are made. The Mary Shrine is also restored. July 25 Solemn celebration of the Centennial of St. James Cathedral. Click here to view the album. On December 22, we mark the centennial of the dedication of our Cathedral, and the conclusion of our three-year centennial observance. Click here for an album. Click here to explore some of the many celebrations of this milestone in our history! February 20. Governor Christine Gregoire creates Washington’s New Americans Policy Council today in a signing ceremony at our own Pastoral Outreach Center. March 9. St. James Cathedral is honored with a visit from H.R.H. Prince Philippe, Crown Prince of the Belgians, in Seattle visiting Microsoft, Starbucks, and other local businesses. June 22. Jean Vanier, founder of the L’Arche Communities for people with disabilities, speaks in the Cathedral. June 29. We mark the beginning of the Year of St. Paul with the celebration of the Solemnity of Saints Peter and Paul, Apostles. July 8. Archbishop Alex J. Brunett observes the fiftieth anniversary of his ordination to the priesthood with a Mass of Thanksgiving and a festive celebration. October 2. Sister Helen Prejean, CSJ, speaks in Cathedral Place Hall. December 21. A major snowstorm hits Seattle, and Mass attendance is down by 80%. September 16. We receive word that Pope Benedict XVI has appointed the Most Reverend J. Peter Sartain the next Archbishop of Seattle. November 30. Archbishop Sartain is received into his Cathedral Church at Solemn Vespers. December 1. Most Reverend J. Peter Sartain is installed as the ninth bishop, fifth Archbishop of Seattle. February 11. The world is stunned by Pope Benedict XVI's announcement thathe will resign the papal throne. March 11. The Cathedral remains open until midnight for a vigil of prayer in advance of the Conclave to elect a successor to Pope Benedict XVI. March 13. Jorge Mario Bergoglio is elected Pope and takes the name Francis.